Welcome to my review of the Acer Go, also known as the Acer Liquid Z220. Three UK have this phone currently as an exclusive, and are selling it for £49 on PAYG. I must admit being a little skeptical as to what a £49 phone could achieve but as you would expect it is not flagship material, but it is fine as a starter phone or for somebody that just wants a cheap no frills phone. In fact it is really usable, which is surreal when you consider its price of just £49. In daily use, I have had no serious issues using this phone. I used it with my main sim installed. Occasionally, I had the odd slow up in terms of speed, but other than that it has been a relatively smooth affair. The screen is low res compared to the highest QHD screens on the market. It is also readable in sunlight and being low res helps it through a working day with regards to battery life. Talking about the battery, it is removable too! This is accessed by removing the plastic back cover. The 8gb storage is expandable for media using a micro Sd card up to a maximum size of 32gb. Wi-Fi and cellular radios reception worked reasonably well too. Calls were clear. The phone runs android 5.0, and is as near to a stock Google Android experience as it gets with just a few extras from Acer to improve upon the experience. This probably explains why the phone performs relatively smoothly during day to day use. The extras included by Acer include Quick Mode for activating the 3 home screen modes. Standard, Easy which enlarges the icons, and Basic which hides all the unnecessary menus. These simpler modes are ideal for someone new to android or an elderly person. Acer adds the following apps – Acer Portal, eBay, Barcode Scanner, System Doctor, Quick Mode and as this is a Three UK phone, there are 3 apps from Three UK. And the rest of the phone is pretty much stock android! In terms of AnTuTu it scored 15,154. Below is a shot from the 5mp camera. Perfectly fine for sharing on social media. In low light, the Acer Go does struggle to take shots, but for its intended purpose and price it is absolutely fine. Overall the camera quality is satisfactory. In fact, there are a number of different modes and options that help extract the most out of the camera. Camera interface. Despite the rear camera only being 5mp, the camera app does include many options including the ability to lock AE and AF. You can also change the exposure and focus point. Other options include 4 shooting modes including HDR, Gourmet and Sports. 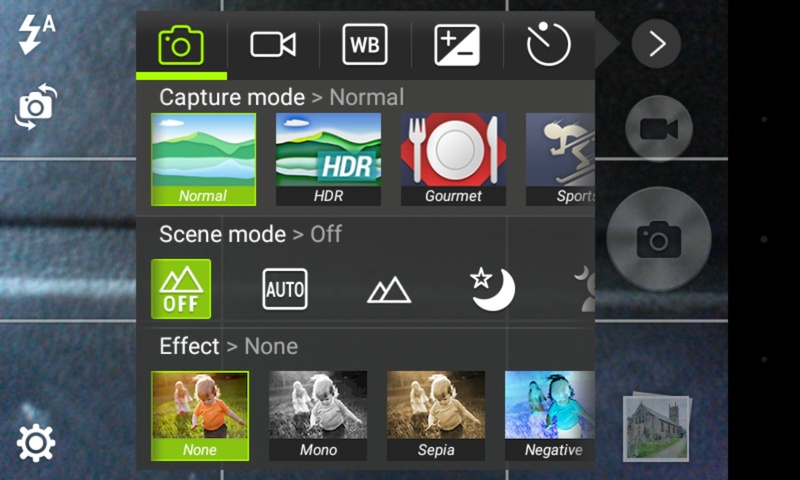 Several scene options are available from night to landscape and more. Audio. No surprises that USB Audio is not supported, nor is the APT-X bluetooth codec. The loudspeaker maxed out at 83db but did sound thin. However it is positioned on the front of the phone. In terms of headphone quality it did seem to emphasise the bass slightly. A rather pleasing sound overall. A FM radio is included too with RDS. I still can’t believe this phone costs £49. If you had this phone you wouldn’t worry about a case and would find it does exactly what you need too. It also shows how for relatively low specs and only £49, you can buy a fairly good smartphone experience. I think there is a new trend here Samsung HTC and Sony have missed. I now have my One plus Two and it is amazing what can be achieved at relatively low cost now. I think Motorola have caught on but not the others. I see two markets now. High end is Apple and all others is medium and low priced Android.